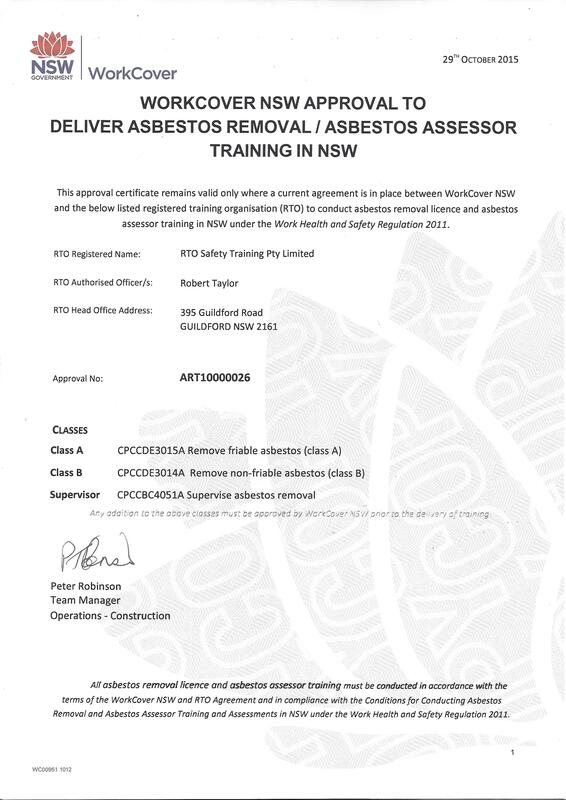 Sydney Safety Training is a NSW Safe Work approved asbestos removal training RTO ART #10000026. 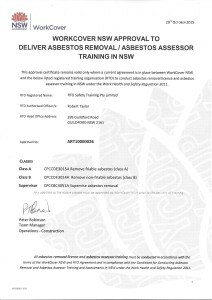 We conduct training and education in specific units of competency for both Class A and Class B asbestos removal work as well as the asbestos removal supervisor certification. The NON FRIABLE (Class B) unit of competency must be completed before the FRIABLE (Class A) removal unit of competency. This is a WorkSafe NSW requirement. All attendees except for AWARENESS must also hold and present on the day of training a Statment of Attainment showing either “CPCCOHS1001A- Work safely in the construction industry” OR “CPCCWHS1001 Prepare to work safely in the construction industry”. Either of these units of competency are also a prerequisite for asbestos training. If you completed a WHITE CARD formal training AFTER September 2009 you will have this unit of commpetency, but not if you DID THE TRAINING before that date. THIS IS NOT A SAFEWORK PREREQUISITE, BUT A NATIONAL TRAINING AUTHORITY REQUIREMENT THAT CANNOT BE WAIVED. Student pack includes: the Removal Code of Practice, generic asbestos SWMS, blank ARCP, 30 point guide on the steps to safely remove asbestos which are yours to keep at the end of training. Now these training programmes can be completed individually or together. Please see below the course options available. A requirement for all staff to complete where asbestos may be found on YOUR site. This is designed to make staff AWARE of asbestos and how to manage it on a day to day basis in the workplace. This is not a removal course. This course allows constructions workers to work on construction sites in the Australian Capital Territory. You must hold this accreditation before you can work on an ACT site. For course details and dates please click here. any other legal requirements (for example, contaminated sites).